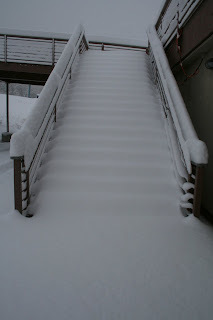 Powderhorn Mountain Resort: What's All This? In a matter of 24 hours we went from mild temperatures and a dry mountain to looking like December or January...definitely not October. This storm has really delivered! We're up to 12" and it's still snowing. 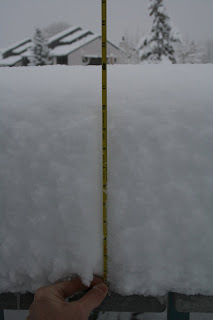 UPDATE: Snow stake reading 11am- 21"
Get the lifts going!!!! HOORAY!!! Where is the "Snow Stake" located? you guys think you could open in late november this year? Do you guys planning on opening earlier than December 18 if this continues? I can't wait till halfway through December. If this snow holds or continues we may be able to open early. We'll certainly open before Dec. 17th if possible. Our Job Fair is on Nov. 14th where we get staffed up, then our orientation is Nov. 21st. We do allow our employees to have Thanksgiving with their families before the craziness begins. So that should give you an idea of when an opening may be possible. Let's hope it doesn't warm up! Looks good to me. Does it make sense to go out there and pack some of that down with the cats so it will hang around awhile?. Never to early to start working on that base is it? That's exactly what we do, start packing a base! please, for the love of skiing/boarding, open earlier. WOOHOO! I love sitting down here in Junction looking up and seeing snow on the Mesa! It is good to see the Mesa all white again isn't it? We received about 16 inches at the base. I'm not sure what was on the stake after is stopped snowing. The guys were having a hard time getting up to the stake as it was very wet, heavy and slick. It's good base-building snow!